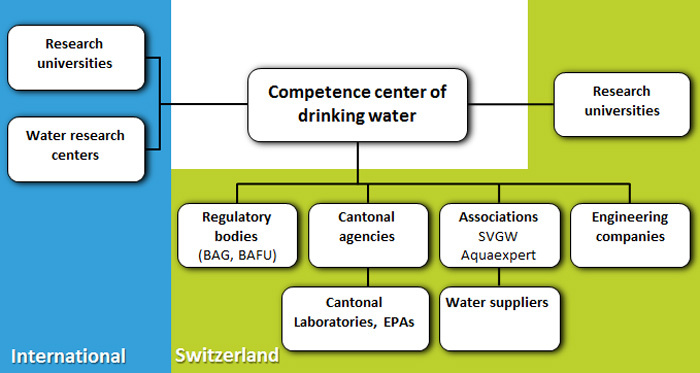 The Competence Centre for Drinking Water at Eawag (CCDW) conducts basic and applied research in the field of drinking water. The goal of our activities is to provide sustainable solutions for the provision of clean drinking water and to support local and federal authorities, drinking water suppliers and external partners in decision making. CCDW has evolved from a cross-cutting project at Eawag, focusing on drinking water supply from surface waters (Wave21, 2003-2008). 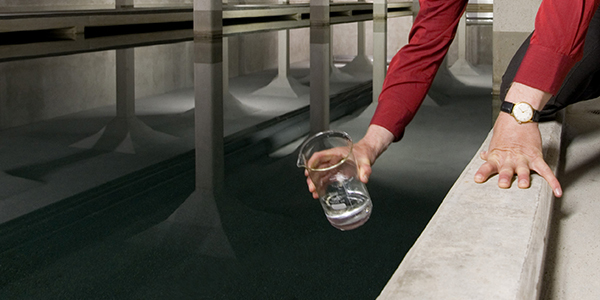 Embedded in the structures of Eawag, CCDW offers a platform to strengthen the exchange between practice, authorities and science and to jointly initiate and carry out research projects aiming at solving drinking water problems. CCDW follows an interdisciplinary research approach and fosters collaboration between research groups from different research fields at Eawag and from external institutions. 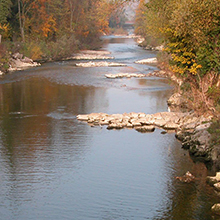 Although water resources are generally of good quality and high abundance in Switzerland, water supplies are confronted with serious challenges, such as climatic and demographic changes, the preservation and renewal of drinking water infrastructures as well as increasing requirements for drinking water quality. Considering the small scale infrastructure of the water supply in Switzerland, particularly small and medium sized water supplies are considerably affected by these challenges. CCDW’s aim is to approach current and emerging drinking water problems by conducting interdisciplinary research projects in cooperation with partners from practice (authorities, water suppliers, external partners, e.g. consulting engineers) and by developing options for future actions. Projects envisioned by CCDW are research-based and go beyond classical consulting. Where possible, the outcome of these projects shall be transferred to drinking water issues in other regions and countries. The focus of present activities lies within Switzerland and industrialized countries, but a link to projects in other regions of the world also exists. 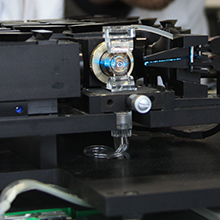 On a project level, CCDW relies on the expertise of established research groups within Eawag and external institutions. 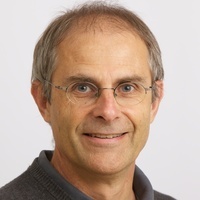 The Head of CCDW (Prof. Dr. Urs von Gunten) is responsible for the content and coordination of the activities and is supported by a project manager. Typically, research projects are externally funded. The personal and content-based structure of CCDW is flexible and can be adjusted along with envisioned projects and emerging key aspects. Investigation of the microbiological quality in raw and drinking water with regard to different water treatment and distribution strategies. 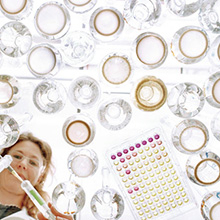 Assessment of inactivation of microorganisms by UV and chemical oxidants. Analysis of appropriate organizational and institutional structures in the regional water supply to meet current and future challenges in the provision of clean drinking water. Investigation of the general public’s assessment of the current situation and possible alternatives in water supply (opinions, preferences, problems, acceptance, confidence) and its knowledge concerning contaminants in drinking water. Investigation of factors, indicators and social processes which influence and determine the public opinion on drinking water quality and water supply strategies (e.g. emergence of hot topics, change in the majority opinion). Development of reactive communication strategies to inform the public about acute problems, while causing minimal anxiety. Development of proactive and preventive communication strategies to ensure the continuous information of the public, leading to a better general understanding of drinking water quality and supply strategies and to strengthen the public’s confidence in water supply. Development of campaigns to influence public behavior concerning water consumption. Eawag publications are available online at the library Lib4RI. Publications concerning drinking water can be found with the search function (keyword: "drinking water", advanced search options are also available). Access to the full text of publications depends on copyright restrictions.